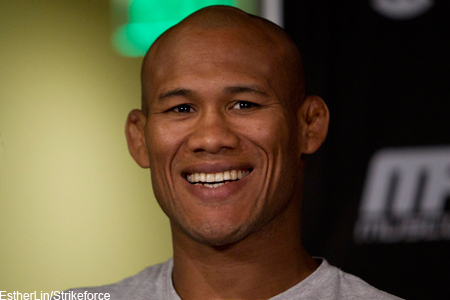 Former Strikeforce middleweight champion Ronaldo “Jacare” Souza (pictured) has been all business since joining the big leagues. The Brazilian sent another stern message to the UFC 185-pound division on Wednesday at UFC Fight Night 28 by steamrolling former top contender Yushin Okami. Despite Okami’s impressive credentials, the Japanese fighter never stood a chance. Jacare dropped him with a right hand early and never let up. After several bombs to Okami’s dome on the canvas, the scrap was finally stopped at the 2:47 mark in the opening frame. UFC Fight Night 28 took place inside Mineirinho Arena in Belo Horizonte, Brazil.